Some blogs are “day books” wherein the author posts a diary type of entry. I thought I’d try that style of post. People sometimes ask me what books I am reading and what music I am listening to, so I thought I’d share some books and music that I have encountered this week. an anthology of essays and images regarding the major movies of Kubrick. I am a big Kubrick fan and I have seen all of his movies going back to the very early works like Fear and Desire and The Killer’s Kiss. This anthology has lots of photos and other archive material from Kubrick’s estate and it was a lot of fun to read. I am also (re)reading A Theory of Justice by John Rawls as part of a research and writing project I am working on. Also in progress is Los Romeros by Walter Aaron Clack which is a biography of the famous family of classical guitarists. I am also working through Playing With Ease by David Leisner that is helping me with some technical issues in classical guitar technique. And for fun I am reading Ulysses by James Joyce. Yesterday was a pretty typical day for me in terms of music. I listened to the Saint-Saens’ Violin Concertos, the Brahms’ 2nd Piano Concerto, the Shubert Piano Trio in E flat Op. 100, and some orchestral tone poems by Richard Strauss including Don Juan (Op. 20), Till Euelenspiegels (Op. 28) and Ein Heldeniegen (Op. 40). I also listened to some Hayden piano trios. I understand that many figures in history (including the history of philosophy) held view that most people (including me) would consider immoral, from the ancient Greeks through the 20th Century. When I discuss such figures such as Kant and Hume in the classroom, I briefly mention some of these concerns. But ideas must be considered on their own merits: the fact that Hume expressed unacceptable anti-Semitic views does not mean the we must automatically reject any consideration of any of his ideas in epistemology or other fields. We must examine the ideas themselves without an ad hominim attack on the source. And the comment about Ludwig Wittgenstein is somewhat misleading. The Wittgensteins were a Jewish family that had become secularized and assimilated into the mainstream culture in Vienna. With the rise of Hitler, the Jewish ancestry became an issue, and in 1938 the family had to purchase a “Befreiung” to reclassify the family members remaining under German control (sisters Hermine and Helene) from Jewish to fully German. I am aware of Ludwig’s comments from 1931 that have a somewhat anti-Semitic tone (which can be found in the book Wittgenstein’s Poker by Edmonds and Eidinow (Harper Collins, 2001)). I don’t think one off-hand comment about how European Jews may be regarded in European history is sufficient to cast Wittgenstein as anti-Semitic, especially given the the events that followed with the rise of Hitler. You most likely have read about the criminal prosecution of a business based in Orange County, California that helped college applicants get admitted to elite colleges by falsifying test scores for the college admission tests (SAT & ACT) and by bribing college sport coaches to arrange for the admission of students with falsified sports profiles. Obviously this business and the parents engaged in fraudulent conduct, and the use of the U.S. Mail and federally regulated banks makes this conduct a federal crime. But there is more going on here, and the one of the more interesting issues is how higher education has been transformed dramatically in the last 50 years. Of course colleges often provide skills and knowledge necessary for many occupations, but it was not always necessary to go to college to earn a good living. A person without a college degree in the 1960s could find a good-paying job in manufacturing in industries like automobile manufacturing and steel. But in the 21st Century most of these jobs have disappeared in the U.S., and the jobs that do not require a college education tend to be low wages jobs such as hotel and restaurant work, retail sales cashiers, etc. This creates pressure on young people to attend college simply to earn a living wage. Many employers will not consider candidates without college degrees even if the college education has little or nothing to do with the specific job tasks. This creates pressure on young people to attend college even if they have little interest in self-improvement or learning about the world. At the same time, the cost of college has increased dramatically. When I graduated from the University of California Hastings College of Law in 1989, the in-state tuition was about $1,000 per year. Now the in-state tuition is about $44,000 per year. Public colleges across the U.S. have lost most of their public funding and have increased the fees charged to nearly the level of private colleges. This high cost puts pressure on college graduates to earn large salaries to pay for the college debt. Given this situation, applications to “elite” or “highly selective” schools have increased dramatically in recent decades. The data on college graduation and employment rates support the conclusion that students who graduate from schools like Harvard, Yale and Stanford are likely to earn more than graduates from other colleges. [But note that the students from these schools tend to be from the wealthy class, so it may not be the college degree that makes the difference. This may be the fallacy of post hoc ergo propter hoc.] There are lots of colleges in the U.S. and you can get a good education at almost all public colleges and universities and many private colleges. But the perception is that the path to wealth and riches is with a degree from an elite school like Harvard or Yale. At the elite schools you can rub shoulders with the wealthy and powerful like the Bushes or the Kennedys, even if you don’t get invited to join the Skull and Bones Club. Does a college education provide a path to wealth and power? Studies have shown that the parent’s socio-economic class is the most significant factor in the earning power of the person and there is a low probability that a child with low income parents will earn a large amount of money. While a college education improves the chances of upward mobility in socio-economic class, it is still very unlikely that a person in the bottom 10% of earnings will move up to the top 10%. I read a study last year that indicated the the percentage of children born into the lowest 10% of wealth have just a 7% chance of wealth in the top 10%. Of course the people involved in the falsified college applications acted in an immoral way, but the problem was created by the wealth inequity in U.S. society. As noted above, the socio-economic system in the U.S. creates pressure on students to get accepted to an elite school. But these schools choose to remain comparatively small so only a tiny fraction of the applicants are accepted. So the schools create a competitive admissions system that purports to identified the “best qualified” applicants that “deserve” to go to the school. The schools attempt to pick the “best” students, and the SAT/ACT test scores and prior school performance do show some correlation with the ability to successfully complete college classes. But the different between an SAT score of 1500 as compared to 1400 is pretty much meaningless and the admission process seems to be more of a lottery rather than a significant difference between students with minor difference in test scores and high school GPAs. This inherent unfairness in the admission process invites the type of abuse that occurred in this scandal. Yesterday Amy & I took a walking tour of some public art in the La Jolla neighborhood of San Diego. (For those who are unfamiliar with San Diego, La Jolla is an older and very prestigious neighborhood with a spectacular Pacific Ocean waterfront.) The art is privately sponsored through the Athenaeum Music and Art Museum, which is a private, membership-based museum in central La Jolla. In recent years the Athenaeum has been more active and more visible in the local arts community with their sponsorship of more concerts and this public art project. Coincidentally, Amy and I went to a concert sponsored by the Athenaeum featuring jazz legend and San Diego resident Charles McPherson (who is also a friend of mine and the husband of my piano teacher). We enjoyed the walk around central La Jolla and looking at the art. The art is in the form of giant murals printed on a plastic material and some are over 40 feet tall and wide. They are mounted on walls of commercial buildings and can be seen easily from a half a block away. They usually have a La Jolla-related theme. 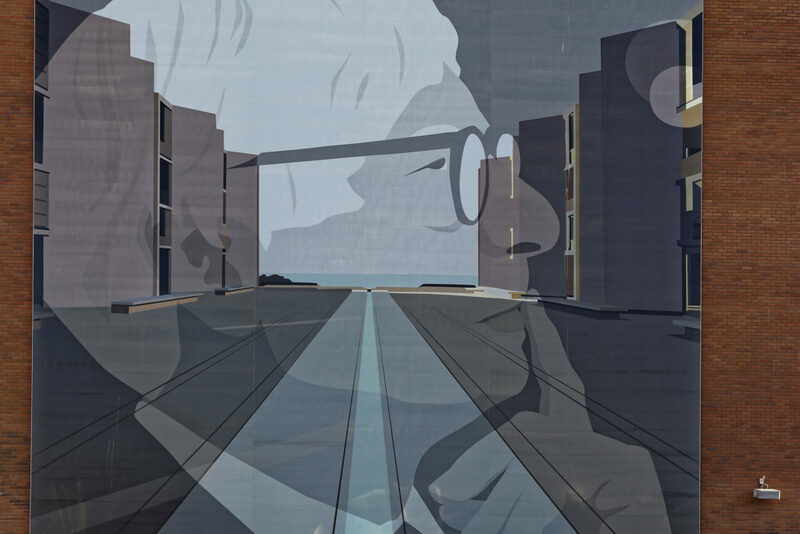 I have two photos below with some favorites from the tour: there is an image paying homage to architect Louie Kahn who designed the Salk Institute that is overlooking the ocean just north of downtown La Jolla. The other image pays homage to author Raymond Chaldler who lived in La Jolla at the end of his life. 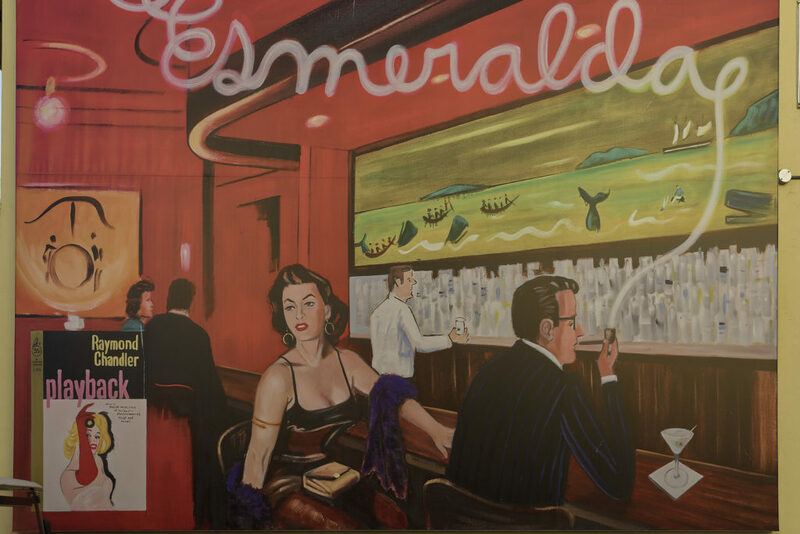 His last novel Playback is set in La Jolla (which Chandler called “Esmeralda”) and the mural depicts the author in the “whale bar” in the La Valencia hotel (which is on the same block where the mural is installed). Last night I was listening to some music and thought about the role of public music in human society. The success of recorded music means that we are inundated with music much of the time: audio and video broadcasts and recordings most often have music, many stores and offices have music playing in the background, cars driving down the street are blasting music, etc. Both art and music have been commercialized in the U.S. and most of the time the “product” is a packaged commercial product that is designed to appeal to the broadest audience (and therefore designed to appeal to the lowest common denominator). There has been much written about the transformation of music and art from a vehicle of personal creativity and expression into a product sold by big corporations for profit. (A good place to start is the essays on music by Theodor Adorno from the early 1950s). Before the invention of the phonograph and radio broadcasting in the late 19th Century, the only way to hear music was a live performance. (Well, actually at the end of the 19th Century you could buy a player piano or even better: a pneumatic attachment for a grand piano that could include louder and softer dynamics in the recorded piano roll. This actually provided much better sound quality than early recordings or radio.) Many people learned to sing and play musical instruments, and there were various public forums for hearing live music. The latter included churches and various concert and theater venues. So I was thinking about “public music” and what the effect may have been on the listeners. Church music is of special interest since the people there would attend for the religious activities rather than to listen to the music per se. For example, I was listening to J.S. Bach’s Cantata “Christ lag in Todes Baden” (BWV 4) which is an early work likely written when Bach was a church organist in Muhlhausen, Germany around 1708. While the orchestration is fairly simple, the harmony, counterpoint and changing rhythms are beautiful (especially in the choral singing in Verse I). Much of Bach’s music represents the intersection of public art (the use in regular church services) and masterpieces. Did the church-goers in Muhlhausen appreciated the artistic beauty? By all accounts Bach was a brilliant organist, but did the common people appreciate the brilliance? Did they find the music as inspiring and emotionally touching as I do? I suppose some did but likely many did not. In our current world there are numerous opportunities to hear brilliant masterpieces in music and to see beautiful masterpieces of art, but it seems that the masterpieces in art and music are mostly lost in the din and noise of the commercial projects. Please feel free to share your thoughts in a comment. We all know what happened in the 2016 U.S. election for president: The opinion polls of voters immediately before the election showed that Hillary Clinton would be the likely winner of the election. In fact, the Trump campaign had not even prepared an acceptance speech for Trump because the odds of winning were so poor. However, the election outcome was a surprise because Trump got just the right number votes in the right places to get enough votes in the Electoral College to squeeze by even though the cumulative vote total gave Clinton about 3 million more votes. I found this event very surprising and disturbing. When I took statistics in college I was required to do a term research project. The project I picked was to use statistical tools to measure the accuracy of the polling in U.S. presidential elections and measure the accuracy of the polling compared to the actual results. I looked at elections going back about 20 years and polls conducted at different times before the election. Not surprisingly, polls conducted well before the election (6 months or more) were less accurate than polls immediately before the election. But what was surprising was that the polls immediately before the election were super accurate: the actual results were accurate within a fraction of 1% of the actual count for polls conducted one week of the election. I wrote the term paper in 1974 (remember Watergate?!) and I have no reason to think that current polling techniques are any worse than they were 45 years ago. In the presidential elections from 1976 to 2012 most polls accurately predicted the outcomes of those elections. Of course we all carefully watched the 2018 mid-term elections. I was very interested to see whether the election outcomes would be consistent with pre-election polling data. In the 2018 election the results were very consistent with the polling. The only “surprises” were in the races where the difference between the candidates was within the margin of error for the poll. In other words, the election results in 2018 matched the polling just like every election from 2014 and before. The outlier is the 2016 election. The Washington Post article states that the U.S. took action to block the Internet access of key Russian government and military cyber operations during the day of the election and “a day or so afterward as the votes were tallied,” according to Sen. Mike Rounds (R-S.D.). Few technical details were released but apparently the U.S. also sent messages through e-mail and pop-ups to the Russians to let them know that there is a new sheriff in town and the U.S. was aware of their actions. What is interesting is the fact that Senator Rounds mentioned that it was necessary to block the Russians after the election WHILE THE VOTES ARE COUNTED. This may tell us about what really happened in 2016: it strongly suggests more than a disinformation campaign — it suggests direct hacking of the vote totals in 2016 in a few key states. We do not have direct evidence to support this claim, but it is the only theory that fits the public facts that we know as of today. This morning I read in the New York Times about a major lobbying effort by insurance companies, private hospitals, drug companies and some doctor’s groups to kill the proposal for “Medicare for All” before it gains traction in the House and in the media. The plan is the same approach used to block or weaken prior proposals: the usual lies that government will control the medical services provided to patients, increased costs to consumers from higher taxes, lower quality care, etc. All of this is misleading at best and mostly outright lies. For example, at present it is the medical insurance company that determines the medical services provided rather than the patient. That is at least as bad as a government official making such a decision (because the government official does not experience a personal profit or loss from the coverage decision, but an insurance company does profit from denying coverage and thus it is motivated to deny coverage). The interesting twist to the story is that the medical industry has had great success under the Affordable Care Act, and the same lobbying effort is promoting an expansion of the ACA. There are already a lot of false claims about the various proposals for expanded public options. For example, a single payer universal health care system will be financed by taxes but in return individuals will save substantial money on co-pays for services, prescription drugs and other expenses. And of course both individuals and employers will save all of the money now spend on insurance premiums. So whiles “taxes” go up, the overall cost of health care will go down. Every other developed country in the world has some version of a single payer system or a public option for everyone and such as system is much less expensive than the mess in the U.S. So don’t believe the lies from the hired lobbyists that a single-payer system means higher cost. Unfortunately the discourse on medical care remains a favorite topic of the domestic disinformation campaign led by Republicans in a scorched-earth campaign against their political opponents (and especially Barach Obama), and will likely be further contaminated by the Russian government’s world-wide cyber propaganda and disinformation campaign. The other tragedy of government I read about this morning is the Brexit mess in the U.K. Another great success for the Russian government’s world-wide propaganda and disinformation campaign. Not surprisingly, the promises of Brexit are not going to be realized and the separation from the EU is likely to cause a significant decline in the U.K. economy. The March 29 deadline for the split is rapidly approaching and a disaster seems inevitable. The single issue that pushed the popularity of Brexit is the concern about immigrants entering the U.K. because of EU membership. There are certainly real concerns about immigration: migrations of populations has been a fact since humans evolved on this planet and it can be extremely disruptive. The Russians have used nationalism and anti-immigrant sentiment as the centerpiece of their social media disinformation efforts world-wide and they continue to have great success with this approach. The commentary in many U.S. history books and in the mass media makes frequent reference to the listener as part of a group: the listener is identified as someone who shares “our American values” and is a part of “our America society.” Frequently the view of historical figures in U.S. government highlights their importance in “building our society” or similar such concepts. All of this assumes a cohesive society with common beliefs, values and interests. However few societies have this sort of cohesiveness and commonality of interest. And our current society is deeply splintered and fractured across many dimensions including gender, race, religion, economics, and social values. Generalizations about “American society” ranges from meaningless platitudes to an intentional attempt at propaganda. So with this in mind I am asking myself what (if anything) should be celebrated on Presidents Day. I recall from my elementary school days that there were two school holidays in February: Lincoln’s Birthday and Washington’s Birthday. By the time my kids were in elementary school the two specific presidential holidays were reduced to the single day Presidents Day. But it is Washington and Lincoln day to me. So let’s think about this and see what there may be to celebrate, with a specific focus on Washington. We all know the basic facts about George Washington: he born into a wealthy family and was well-educated. He inherited the family plantation in Virginia and was a slave owner (but he did free his slaves on his death by will). He was a member of the group that promoted the U.S. revolution, was a leader in the Revolutionary War, and was the first U.S. president. For Washington and other southern states land owners, the U.S. revolution and the resulting independence from England would reduce his taxes and increase his profit and trade opportunities. The main result of the U.S revolution was lower taxes for the wealthy while plantation workers and others remain enslaved. This doesn’t seem like anything to celebrate. So what if Washington and his peers had failed in their effort to escape English taxation and the English colonies in North America remained in the political control of the United Kingdom? Would things be better or worse now in the colonies? Of course any such exploration of an alternative time-line is sheer speculation, but it is interesting to consider the possibility. It’s probable that the U.S. would have a political structure similar to British Commonwealth countries with a parliamentary central government and without the semi-autonomous individual state governments. This system would be much more democratic than the governmental mess that is now in the place in the U.S. If the U.S. remained under British control then the slaves in the U.S. most likely would have been freed by the British Slave Abolition Act of 1833 (30 years before the Emancipation Proclamation). That would have been a significant reduction in human suffering. We cannot reset the clock in history and so we are stuck with the world as it is in 2019. There are some U.S. presidents that have helped to improve the human condition within the parameters of the U.S. government as they found it. My short list would include Theodore Roosevelt, Franklin Roosevelt, and Barack Obama (who undoubtedly is the best president in my lifetime [so far]). Of course the hands-down winner of the U.S. president who caused the most harm to humanity is Donald Trump. Posted in Commentary	| Comments Off on Happy Presidents Day? I retired from wage labor at the end of 2018. I started working for a paycheck when I was a young teenager working part-time at Musicraft, which was a retail store where my parents worked (and later my sister and my brother-in-law). Musicraft originally sold LP records and “hi-fi” audio equipment (such as the original tube equipment made by Frank McIntosh, Avery Fisher and Sol Marantz, speakers by James B. Lansing, etc.). When I started working there the records were gone, and transistor and stereo equipment was just starting to appear on the market. Over the years there were many occasions when I enjoyed work, and especially the legal and teaching work that I was doing after graduate and law school. But now, after over 45 years of working, I have the luxury of doing what I am interested in doing instead of what I was required to do to earn a living. So the question is what to do in retirement? There are the usual things that retired people do: travel, cooking, craft projects, etc. Fortunately my health is still pretty good and I can do many of these things. Specifically I am spending more time listening to music (especially classical) and working on improving both my piano and my classical guitar skills. Amy and I have a number of fun trips planned, and I am also spending time improving my photography and cooking skills, and doing a little woodworking. But I also want to share some of the insights from my experiences in life and my study of analytical philosophy, science, and history. To this end I am working on an essay that brings some of these ideas together in a way that sheds some light on the forces that shape human history. I am currently doing research to collect the evidence to support my thesis and I hope to have an initial draft in 18-24 months. In future posts on this site I plan to share some of the ideas from this essay as they develop. I will also be sharing other observations that may be of interest, so please check back on occasion to see what is new. Welcome to the Web site of Gary M. Letchinger! I will be posting comments on books that I am reading, ideas for writing projects, and other ideas that pop into my head that may be of general interest. Please check back occasionally to read the latest. Posted in Site News	| Comments Off on Welcome!